Gut Reaction is a specialised nutritional therapy and wellbeing coaching practice offering a range of professional services designed to help individuals and businesses transform health and wellbeing. I set up Gut Reaction in 2013 to fulfil a niche in the market for my highly personalised, committed and integrative approach to advising and supporting clients in transforming their health and wellbeing. My clients are typically busy people who need to perform in their work and private lives - including entrepreneurs and business owners, high-profile and public figures, senior personnel, and parents - all who are ready to reconnect with good nutrition and lifestyle habits in a manageable, meaningful way. My clients come from a variety of backgrounds and cultures and, through my virtual clinic, I look after people all around the world. I also support a number of high-profile personal trainers, boutique spas and members clubs, and deliver corporate wellbeing workshops and programmes. My philosophy is that the gut, both in terms of our gastrointestinal workings and also as an emotional system, is at the core of our well-being, and that our diets should be based around ‘real food' - that is food in its simplest forms - un-tampered and uncomplicated nourishing raw ingredients which are products of nature - not industry. With so much 'noise' out there, sometimes it may seem hard to know how to approach a balanced, tasty and nutritious diet. Incorporating a wide variety of highly nourishing and delicious 'real foods' is, in my view, also one of the most pleasurable and sustainable routes to life-long health and wellbeing. However, eating and living well is both an art and a science. And my fresh, creative approach goes beyond nutrition and food - it's about enabling my clients to identify all the areas of their lifestyles that they can better 'nourish' to the benefit of their bodies and minds. This means taking a ‘360° approach’ and addressing the many ‘layers’ that make up our health and wellbeing including psychological and emotional dimensions, alongside the physical. Combining nutritional therapy and personalised lifestyle medicine with wellbeing coaching, my training allows me to draw on a whole range of modalities to help my clients achieve this, including techniques from mind-body medicine practices, positive psychology, NLP, and functional medicine, as well as sign-post people to the other modalities of health and healing if and when appropriate. Since achieving my Diploma in Nutritional Therapy in 2013, I have undertaken further training specialising in weight issues, and have studied with the National Centre for Eating Disorders, completing a course in Psychological Approaches to Obesity. As a long-term associate of Patrick Holford's Zest4Life, I am continually developing my skills as a motivational health coach, drawing on NLP, CBT, ACT techniques and mindfulness, and incorporate Zest4Life eating plans into Gut Reaction’s programmes as appropriate. 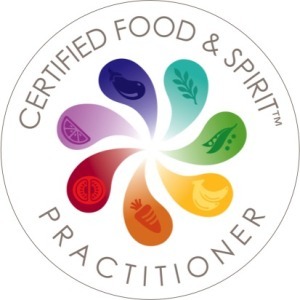 I am currently studying under the wing of Dr Deanna Minich, training to become a certified Food & Spirit™ practitioner in early 2019, to add further dimensions to my wellbeing coaching. A full member of the British Association for Nutrition and Lifestyle Medicine (BANT), I adhere to the strict BANT Code of Ethics and Practice, and am a member of the Complementary and Natural Healthcare Council (CNHC). Gut Reaction is fully insured for Nutritional Therapy. In order to help me stay at the forefront of my profession, I invest time reading the latest research papers and maintaining CPD, with a particular focus on mind-body nutrition and gut health.